← Trust: The Missing Link Between Faith And Science… And Every Other Aspect Of Being Human. Last Friday evening, the western Michigan sky had a very unsettling hue to it. It had been cloud-covered and raining all day, but instead of typical shades of gray and red-orange of sunset, the sky was a sickly yellow. "That's not right" I said, staring at it in confusion. Animation showing carbon monoxide (in orange/red) from California's massive wildfires drifting east across the U.S. between July 30 and August 7, 2018. It was produced using data from the Atmospheric Infrared Sounder (AIRS) on NASA's Aqua satellite. 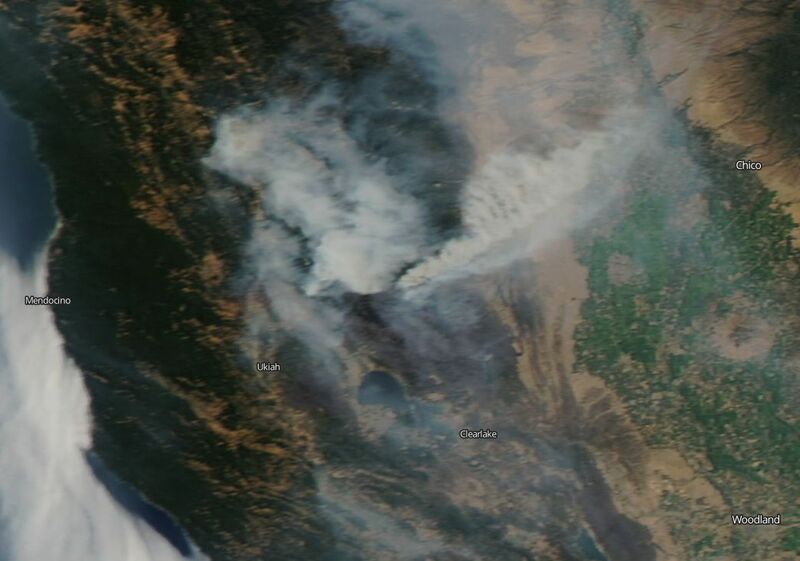 Trails of smoke and carbon monoxide from massive wildfires in California have drifted eastward across the U.S., one branch moving toward Texas and the other forking toward upper Michigan and Canada. Carbon monoxide is a pollutant that can persist in the atmosphere for several weeks, and be transported long distances; it plays a role in both air pollution and climate change. There are several photos online showing an orange-red first-quarter Moon - which is just WRONG! A couple friends said they saw this... all I've seen for days is clouds and haze. Mary Cruickshank-Peed, a friend living in Michigan's Keweenaw Peninsula, says she was awoken early last Tuesday morning by the smell of smoke. She suspected it was the fires out west, as they have been all over the news casts, but had to check her house and then the neighborhood anyway... Mary says her skies have been very hazy lately too. Alice Bentley, a buddy on Vashon Island, says that haze moved in Sunday evening shortly before sunset, "turning the sun brick red, then obscured, with enough particulates to look like a heavy fog had rolled in." Bill Kippen, an astronomer buddy from the Warren Astronomical Society was up in the Tahquamenon falls area for the Perseid meteor shower. Bill says the transparency of the sky less than predicted, and viewing was poor. Fr. James Kurzynski posted on Facebook that he's been having odd sinus issues recently that aren't allergies or sinus infections. A post from NBC News claims that in just a few days, the California wildfires have released as much air pollution into the Bay Area as motorists in the state typically emit in an entire year! Northern California and the Central Valley saw drastic reductions in air quality; I'm wondering what effect this might have on the upcoming winter? The largest fire in California's history, the Mendocino Complex, is still spewing clouds of smoke across the state. Smoke from this fire and other California fires can be seen as far east as parts of Montana and then up into Canada. Image credit:NASA/Goddard Space Flight Center Earth Science Data and Information System (ESDIS) project. I created this video using NASA's Eyes on the Earth - a module within NASA's free Eyes on the Solar System app - Available here: https://eyes.nasa.gov. It shows atmospheric carbon monoxide from the California wildfires spreading across the U.S. between July 24 - August 20, 2018. Our hearts go out to the families of firefighters and civilians who have lost their lives and been injured in this fire, and to the people who have lost homes and businesses. There are a number of charitable organizations helping with recovery efforts.